A beautiful view of Nagasaki Harbor and Ebisu Shrine (恵美須神社) taken from Akunoura (飽の浦). The mountains to the left are Mt. Konpira (金比羅山) and Mt. Tateyama (立山). Ebisu Shrine was located right across the bay from Deshima (also: Dejima), the fan-shaped artificial island where the Dutch merchants kept their trading post between 1641 and 1853. The shrine played a minor role in Japanese history when it became the special office of the Nagasaki Magistrate Matsudaira Zushonokami (松平図書守) during the so called Phaeton Incident of 1808, when a British warship entered and threatened Nagasaki Harbor. At this time, Japan only maintained relations with the Chinese and Dutch. 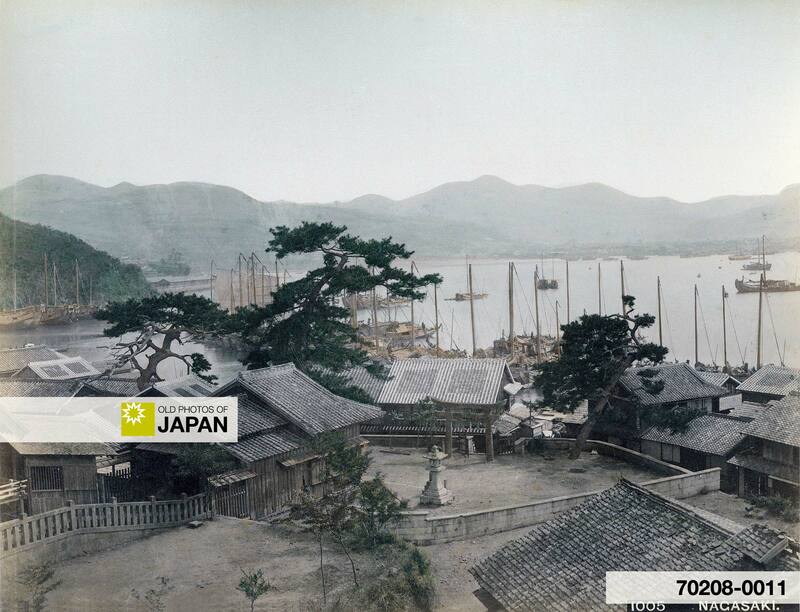 Ships of other nations were strictly prohibited from entering Japanese harbors under a policy of maritime restrictions now known as Sakaku (鎖国). On October 14, however, the English frigate HMS Phaeton, flying a Dutch flag, entered Nagasaki harbor to capture Dutch trading ships. The Netherlands during this period were occupied by Napoleonic France, and Dutch ships were therefore seen as enemy vessels by the English. The Dutch flag fooled both the Japanese and Dutch merchants on Deshima, who rowed out to the Phaeton to welcome the ship. As soon as they came close, the Phaeton captured the Dutch representatives and demanded water, food and fuel from the Japanese. If the English demands were not met, Nagasaki Harbor would be bombarded, the Japanese were told. Unfortunately for the Japanese, the harbor was insufficiently protected at this time. Additionally, the Japanese military communications were not prepared for a maritime emergency like this. Matsudaira was therefore forced to give in to the Phaeton’s demands. When the ship left the harbor on October 17, Japanese reinforcements had still not arrived and the magistrate committed ritual suicide by seppuku to accept blame for this obvious breakdown of the country’s defenses. As a result of the Phaeton Incident, the Japanese government improved coastal defenses, strengthened laws against foreigners entering Japan and began the promotion of the study of English and Russian. Just six years after this event, the first English-Japanese dictionary was published in Japan. Looking at the shrine courtyard on this photo, you can visualize messengers and officers running around nervously while inside the shrine people are discussing measures to deal with the crisis. They had an absolutely perfect view of the harbor, but no means to defend themselves against a modern warship armed with 38 menacing guns. The Japanese themselves had no ship that even approached the power and scale of the 944 ton Phaeton. Additionally, there were barely troops to defend Nagasaki and reinforcements were many days removed from the city. The enormous helplessness, confusion and anger they must have felt is easy to imagine. Either because of its beautiful location and clear view of the harbor, or because of its historical significance (or perhaps both), a lot of photos were taken from this location. None of these, however, have as many fishing boats as seen on this image. It clearly shows that this area was inhabited by a very large number of fishermen. Ebisu Shrine still exists, although the shrine buildings on the above photo have long since vanished. As has the beautiful view. This is now completely blocked by Mitsubishi factories. You can also licence this image online: 70208-0011 @ MeijiShowa.com.